During the reign of the Roman Emperor Hadrian in approximately 117 C.E., the 5,000-strong Ninth Legion of the Roman Empire disappeared from history, its fate a mystery. Unsurprisingly, the Ninth Legion’s fate has engaged serious scholars and history enthusiasts for decades in books, articles, and other media. Were they disbanded? Sent to fight on the Eastern Frontier in Europe and defeated there? Or, in the interpretation favored by serious and armchair scholars, was the Army slaughtered in Caledonia (modern Scotland)? 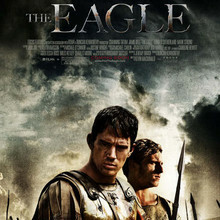 The Eagle, based on Rosemary Sutcliff’s 1954 novel The Eagle of the Ninth focuses not on the fate of the Ninth Legion, but on Marcus Drusillus Aquila (Channing Tatum), the surviving son of its long-dead commander. Still haunted by his father’s disappearance and presumed death, Marcus, a Roman centurion, chose a small British garrison as his first command. Initially distrusted, he proves his worth as a commander by ordering repairs to the garrison’s walls and defenses, and when non-Roman warriors attack one night, leading his men in a spirited counter-attack that gives The Eagle its first of several set pieces choreographed by Oscar-winning director Kevin MacDonald (The Last King of Scotland, Touching the Void, One Day in September). Injured in the counter-attack, Marcus’ men transport him to a well-ordered Roman town far away from the frontier. Under the care of a long-lost uncle (Donald Sutherland), Marcus begins slowly recovering. At a gladiator entertainment event, Marcus, impressed by the willingness of a slave, Esca (Jamie Bell), to risk death rather than fight or defend himself, pleas for the slave’s life and succeeds. Esca then becomes indentured to Marcus and an uneasy alliance arises when Marcus, learning that the legion’s standard, the “eagle” of the title, has been spotted in mountains of Northern England, beyond Emperor Hadrian’s Wall. Hadrian’s Wall demarcates a physical, geographical barrier and a narrative, dramatic one. We’re told that the known world end with the wall. Beyond it, Marcus’ privileges and rights as a Roman citizen no longer apply, in turn subverting his relationship with Esca, whose status as Marcus’ slave becomes murky. Outside the, The Eagle shifts conclusively to a quest narrative and, later, a chase narrative as Marcus and Esca race back to the relative safety and security of Roman-held territory. Sutcliff wrote “The Eagle of the Ninth” as a “young adult” novel and it shows in the action-oriented four-fold structure Macdonald, screenwriter Jeremy Brock, and producer Duncan Kenworthy, transferred from Sutcliff’s novel to the big screen. Keeping audiences engaged, especially during Marcus’ prolonged convalescence, is certainly a challenge — one Macdonald probably should have trimmed — but it’s only a minor problem easily overcome once Marcus’ quest for the eagle of the title properly begins. From there, The Eagle mixes brief, character-revealing dialogue with action sequences. Working, presumably, with a limited budget, Macdonald uses autumnal Scottish exteriors as almost another character in the film. Macdonald also doesn’t rely on CG-enhanced crowd scenes or armies to fill out the battle scenes, a decision that might frustrate moviegoers hoping for the epic scale typical of the genre. The Eagle is at its most compelling, however, in the parallels Macdonald and Kenworthy draw between the Roman Empire and the American one, casting Americans as Romans and non-American English speakers as Britons. Marcus unquestioningly believes in the Roman Empire’s primacy among empires, of conquest and occupation (however enlightened or benevolent), and his own place within the Roman hierarchy. Honor and restoring his family’s good name overwhelmingly dictate Marcus’ decisions. It’s Esca who has to remind Marcus that Rome’s empire building has come at a terrible cost to the conquered and subjugated. The Eagle, however, only explores that particular theme superficially. Anything else will have to wait for the sequel.